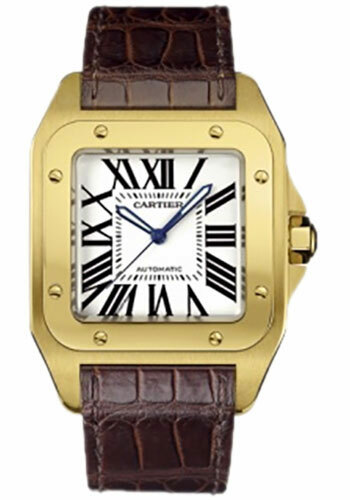 Large size, 18K yellow gold case, silver dial, automatic winding mechanical movement, alligator strap with 18K gold deployant buckle. Water resistant to 100 meters (330 feet). Large size, stainless steel case with 18K yellow gold bezel, silver dial, automatic winding mechanical movement, and stainless steel and 18K gold bracelet. Water resistant to 100 meters (330 feet). Large size, stainless steel case with 18K yellow gold bezel, silver dial, automatic winding mechanical movement, alligator strap with deployant buckle. Water resistant to 100 meters (330 feet). Large size, 18K pink gold case, silver dial, automatic winding mechanical movement, alligator strap with 18K gold deployant buckle. Water resistant to 100 meters (330 feet). 51.1mm x 41.3mm stainless steel and ADLC case, 10.34mm thick, 7-faceted crown set with a faceted synthetic spinel, sapphire crystal, black dial with sword-shaped hands in steel and luminescent material, caliber 1847 MC self-winding movement, black fabric strap, steel triple adjustable folding buckle. Water resistant to 100 meters.